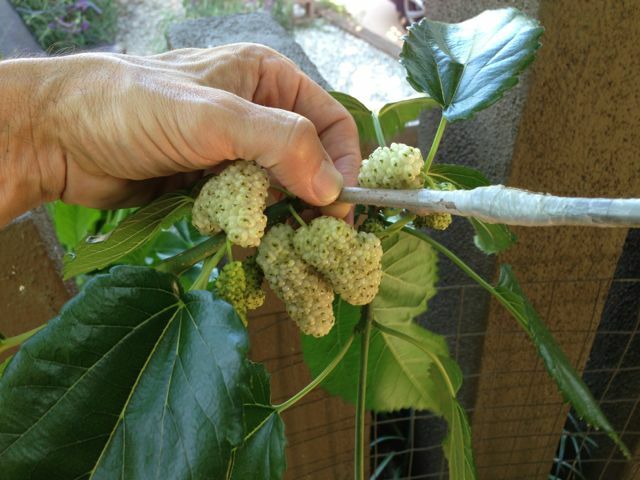 Mulberry.....to coppice or just prune? We have an Illinois Everbearing in our poultry run which we pollarded to provide shade and to use as chicken and duck feed. The birds have zero interest in the leaves, but are glad to have the fruit. The tree is very vigorous and provides a nice quantity of mulch, though. We also have a contorted mulberry which is too lovely and not conducive to coppice, and I just prune it aggressively to keep it small. The berries are smaller, but tasty nonetheless. Oh, I like this question. Our local community garden is adjacent to our neighborhood playground, and I've been concerned about chemical pesticide/herbicide use as well. One thing that has been to help encourage perennial agriculture and less soil disturbance in our local community garden where user turnover and annual veggie production is the norm is that one whole length of the garden outside of everyone's allotments has been dedicated to fruit crops that are to be shared by all members. Another small step is that the city has been good as providing a large pile of woodchips every season and encouraging community gardeners to mulch to save water and reduce weed pressure. Perhaps if you want to give a talk to folks in that setting, you might emphasize the time saving and cost saving aspects of permaculture - community gardeners have to travel from their homes to their plots, and focusing on the labor and time saving elements of permaculture might help to draw them in. Pine tannin. Tannin loving plants? Where are you located? Gooseberries and currants like temperate climates. Gooseberries, currants and such do very well in partial shade. I have black currants and white currants in full shade that produce very large yields. I made a small hugel bed out of pine, mulched on top with pine needles as well. It has low bush blueberries under planted with native Oregon strawberries and nagoonberries...and in the back it has black currants and red currants. Also stuck a bu ch of columbine here an there, too, as they are lovely and tolerate acidic soil. Rich, it is concrete, and definitely has a gravel base. We will remove the gravel, too, but I was thinking of initially just planting it with artichokes and comfrey and oriental poppies and what-not to help break up the compacted soil. Have had good luck several times in the past with growing an artichoke in an area of compacted soil for two years, removing it, and planting a fruit tree in its place. It does a fantastic job of loosening the soil. Yes, I agree, it's not much to worry about. Chris seemed concerned, though. But since so much else is edible in our yard, I especially like to make a point of letting kiddos know what few things should NOT be eaten. If you want to eat the hollyhock blossoms and day lilies, go for it kids, but leave the digitalis alone. I had foxgloves volunteer where I didn't want them, and so moved them to a shady out of the way place. Didn't buy them or anything. I do love how prolific they are along the roadsides in Oregon. Good to know another Portlander. Your name sounds familiar. Are you an HOS member? This thread is like a ray of sunshine. Beautiful gardens, everyone! We are seriously considering removing half or all of our driveway (two cars wide x two cars deep) and expanding our front yard garden. The area was a flower garden five years ago when the previous owners changed it into a driveway. We would like to restore all or part of it to cultivation. Does anyone have experience in - and advice for - the removal process? The process of restoring the area before planting? Can anyone share experiences in cultivation of an area that was previously driveway? Dealing with compaction? What has grown well, what hasn't? George, thank you for recommending Coe's Comfrey. Got the ten organic Russian comfrey root cuttings I ordered and he threw in five more for free. All are potted in the house and have begun to sprout leaves rapidly. We are in outer NE (Parkrose neighborhood). There are at least two other permies I know of in our neighborhood. The lots out here are larger (we have 1/4 acre, but several 1/2 and a few 3/4 acre lots around as well) and neighbors are more accepting of unconventional ideas.